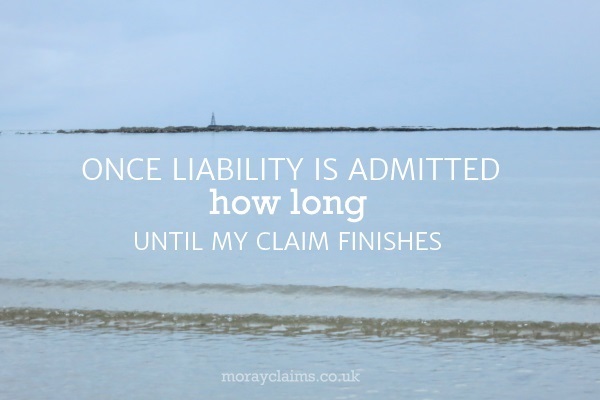 How Long Until My Claim Finishes (Once Liability Is Admitted)? You are here: Home / FAQs / How Long Until My Claim Finishes (Once Liability Is Admitted)? This is a question we received via a Free Enquiry to our website. Another way to put the question would be: once the third party insurers have accepted responsibility to pay compensation to me, how long until my claim finishes? That you do not have a solicitor and that you are dealing directly with an insurance company. That the insurers have instructed an independent medical expert, who has examined you and the relevant medical records. (The insurers need to have the independent report in order to be able to value the claim for your injuries and, from that, work out what other parts of your claim may exist and what they may be worth. Other possible aspects of a case in the usual case include: wage loss; services; and miscellaneous expenses (for example, costs incurred in attending medical and physiotherapy appointments). What is a “proper” medical report? It is generally necessary, in order for it to be a “proper” report, that it should be based on a specific medical examination of you. It is not likely to be in your interests if any report is just based on an examination of the medical records. You should certainly ask to see a copy of any report which is produced, if for no other reason than to make sure that it does not contain any obvious mistakes or inaccuracies. However, beyond that, you may disagree with the report’s assessment of your present state of recovery or prognosis. If so, you may need to consider getting your own independent expert’s report. Insurance companies tend to have preferred medical experts whom they use. As you might expect, these experts are chosen because they are rarely overly-sympathetic towards claimants. (There is a separate article on this website which deals specifically with medical reports in personal injury claims). Timescales vary from medical expert to medical expert, as regards how quickly they will produce their report after a medical examination. Sometimes delays can occur which are outwith their control (for example, a delay in copies of the medical records reaching them). However, the reasonable band of timescales for provision of a report after a medical examination probably ranges from about 6 to 10 weeks. This “reasonable” timescale for an offer assumes that the report is not recommending that you should go back for a further examination in, say, six months – which may be necessary to allow the doctor to give a more accurate prognosis. It also assumes that the doctor does not, for example, recommend that you should be examined by another medical expert, in addition. For example, an orthopaedic surgeon might sometimes recommend that a report also be obtained from a psychiatrist, if it appears that there may be some psychological illness stemming from the physical injuries. If and when the insurers do make an offer to you, it is important to make sure that you understand the basis of the offer. If they have only obtained a medical report, and they have not obtained any other information from you, any offer they make may only be for the pain and suffering of your injuries (in Scotland, “solatium”). In other words, the offer may not include any elements for wage loss or other heads of claim. As you will be aware from other articles on this website and on Grigor & Young’s website, we do not recommend you to deal with a personal injury claim yourself. If liability is admitted in your case (which we assume for the purposes of this article), there is every chance that you would be able to find a specialist solicitor who would be willing to agree to deal with your claim on the basis that you will receive any negotiated level of compensation in full (i.e. so the solicitor is “cost-free” as far as you are concerned). How does your solicitor get paid? The solicitor will be paid separately by the insurers according to an agreed scale. The level of fee the solicitor receives is proportional to the level of compensation paid to you but it is paid in addition to your compensation. If you do not have a solicitor at this stage, now would be a good time to get a solicitor because you will be able to maximise the benefit you get from their advice. We are not saying that all insurance companies are out to “do” you but, by definition, they are not there to act in your best interests, whereas a solicitor is. Feel free to get in touch with us if you have any questions arising from this article or regarding any aspect of our personal injury claims service. All initial enquiries are free of charge and without obligation. You can contact either of Moray Claims / Grigor & Young’s specialist, accredited personal injury solicitors – that’s Marie and Peter – via 01343 544077 or by sending us a Free Online Enquiry. This article has considered possible pitfalls which might mean you end up with less than the fair value for your claim. You may also want to have a look at our free 16-page PDF eBook – 5 Ways to Avoid Losing Money on Your Personal Injury Claim in Moray – which you can access here (links to explanatory page, not a direct download).